I like this. An understated, witty reminder. To celebrate the 50th anniversary of the famous ‘After Eight’ mint, once manufactured here at Rowntree’s, the old factory clocks were adjusted, to just after eight. 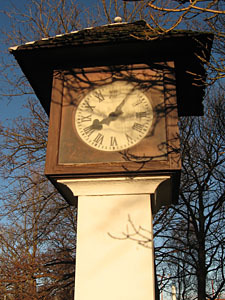 There are three clocks: two on Haxby Road, one on Wigginton Road. They need mains electricity to run, and they haven’t had that for some years. They all told different times, until earlier this month. The Press reported that Nestlé employee Nigel Anfield, whose family members have worked at the factory for more than a century, moved the hands. Mr Anfield said ‘It is a small gesture for the anniversary but something that will act as a reminder for many years’. 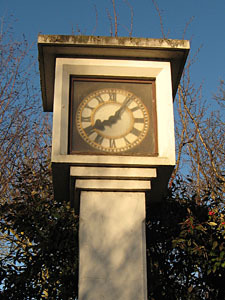 Perhaps not if you’re on the Wigginton Road side, where this clock has just disappeared. I took this photo a couple of weeks ago, but noticed an empty clock case when we went past yesterday in the car. I feared it had perhaps been stolen, though by whom I wasn’t sure. Guerrilla horologists perhaps. I emailed the press office at Nestlé. Apparently ‘the clock in Wiggington Road has been taken away to see if it can be repaired and run on batteries’. Why this has been done just after they’d deliberately drawn attention to the clocks no one has looked at for years I don’t know. 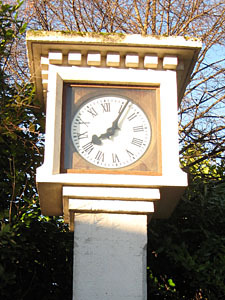 A visit in December 2010, recording buildings since cleared on the Nestlé South site, and the stopped clock on Wigginton Road.